Advanced cavities. Tooth decay is a progressive disease that sometimes resists remedy through more traditional methods. A crown reinforces and protects a tooth which has lost much of its volume. Fractured or broken teeth. 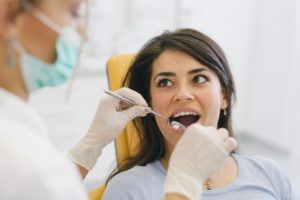 Falls, sports injuries, auto collisions, and other common types of accidents may have repercussions for the victim’s dental health. A crown can save a distressed tooth that might otherwise require extraction. A filling that, by itself, cannot protect the tooth over the long-term. This sometimes occurs when disease or damage has weakened its internal structure. To provide a foundation for a bridge. Crowns are often used for this purpose. Symptoms of bruxism (teeth grinding). Many people clench their jaw, either during sleep or as a result of nervous tension. Over time, this can wear down a tooth’s surface. A crown can replace the lost material, restoring lost functionality and correcting aesthetic issues. Normally, receiving a crown is a two-step process. During the first visit, the dentist will examine the problem tooth and design a crown to fit its particular shape. The dentist will send this information to a lab, which will prepare the final crown. In the second visit, the dentist will shape the existing tooth to fit the crown. He or she will ensure proper fit before binding it permanently. Pain blockers are used throughout the process. The dentist might also use anesthetics to relieve anxiety and help the patient relax. It’s normal to experience some soreness during the days and weeks after a crown is emplaced. Usually, over-the-counter medications such as aspirin or ibuprofen are sufficient to treat this problem. It’s important to let your dentist know about any ongoing issues you have with your crown. In almost all cases, the recovery period is free of complications. An extraction can weaken the surrounding teeth, leading to further problems down the road. A missing tooth can hinder the patient’s ability to eat, speak, and perform other essential tasks. An extraction can leave an exposed nerve in the person’s mouth, causing long-term discomfort. Ask your dentist if a crown is the best solution in your situation. This gentle, effective form of treatment might be just what you need to put a smile on your face. Dr. Arindam Kakkar is a graduate of NYU College of Dentistry. He’s a member of Omicron Kappa Upsilon, an honor society for outstanding dental professionals. You can reach his office online or by calling 908) 850-0005.